Download Free Printable Angry Birds Word Search. Looking for Free Printable Angry Birds Word Search for you next birthday party? Here is your free Angry Birds printable word search puzzle to have fun with your kids. This easy to print puzzle is filled with 16 Angry Birds video games favorite characters. Find Angry Birds words like Red, Terence, Eggs, Pigs, Stella, Matilda, Space, The Blues, Dragon, Eagle, Chuck, Bubbles and many more. 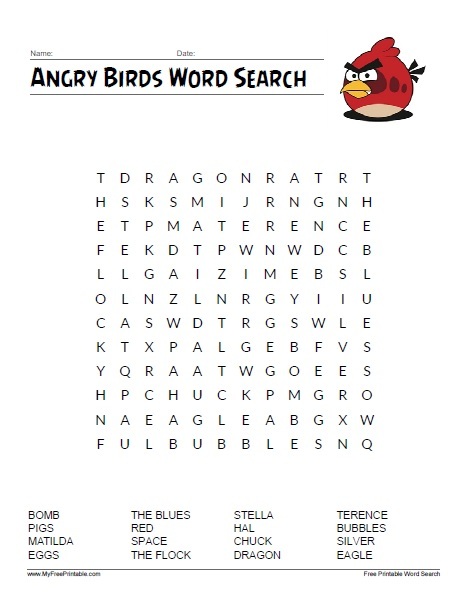 Click the link below to download or print the Angry Birds Word Search Game now in PDF format.